Amana makes several appliances including dishwashers. While several internal components of Amana dishwashers can affect the way the machines clean your dishes, two of the most important are the water inlet valve and the heating element. 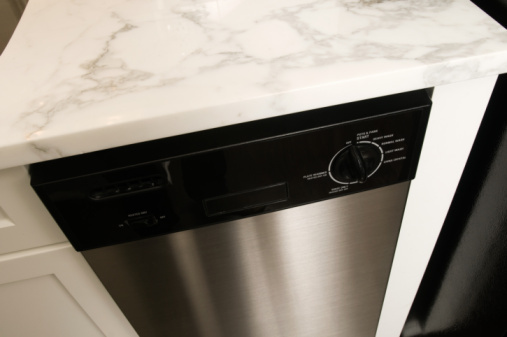 The water inlet valve fills the basin inside the dishwasher with water. The heating element then heats up the water. If you've noticed that your dishes are not clean after completing a cycle, these are the two main components to troubleshoot. Inspect the LED lights on the front panel. If the light next to "Start/Cancel is not lit up, open the door latch and then securely shut the door. In addition, make sure you have a cycle selected on the keypad. Check the water shut-off valve that regulates the flow of water. In many cases, it's under the sink. Make sure the valve is on. Check the circuit breaker that controls the dishwasher. Amana dishwashers have a "direct" connection to the panel. If the breaker is off, the machine will not run or produce water. 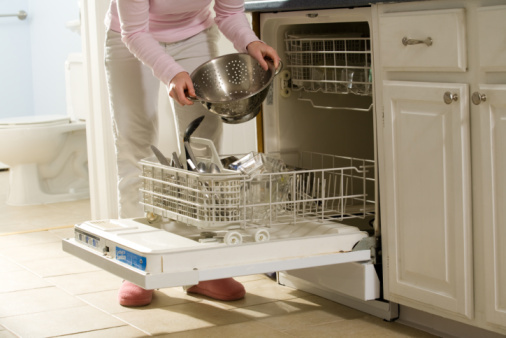 Turn on the Amana dishwasher and begin to run a standard cleaning cycle with the machine just as you would normally. Open the door after five minutes to automatically stop the cycle. Although the Amana dishwasher will send water to the basin, the heating element will not heat the water to a point where the steam can burn you within that five-minute period. Inspect the basin of the dishwasher. The basin is the bottom of the dishwasher located under the bottom dish tray. If you see approximately 1-inch of water resting in the basin, your water inlet valve works properly. If the dishes are dry and you see no water, the inlet valve is defective. Locate the breaker panel and turn off the breaker for the dishwasher. Amana dishwashers use a "direct wire" connection and do not have a standard power plug. To check continuity in your heating element you must remove power to the dishwasher. Open the door, remove the lower dish tray and then locate the heating element. The heating element rests over the basin and it is a round metal tube bent into a rectangle. Locate each end of the metal tube as it goes down into the basin. Make a mental note of where the two ends enter the basin so you can locate them from the underside. Close the door and then remove the bottom access panel from the space between the door and the floor. You will locate a screw on each end of the panel. Remove the screws with a screwdriver and then place the panel off to the side. Pull the wiring harnesses off each end of the element where the element protrudes through the floor of the basin. Locate the harnesses by looking into the access area under the dishwasher. To remove the harnesses, simply pull them off. Pull on the harnesses, not the wires connected to them. Place your multimeter on its "ohm" setting. This setting tests continuity in metal. Place one lead against one end of the element and then place the second lead against the other end of the element. If the readout on the multimeter displays 'zero" or "0" the element is defective. If the multimeter displays any other number, there is continuity in the element and it is working properly. Check the dishwasher to ensure it rests level. Do to so, place a level across the front top. If it rests in an uneven position it could leak from the front seals. Inspect the seal on the front of the door for cracks, tears or puncture holes. A defective seal will cause the unit to leak. Switch detergent brands to one that produces less suds. The leak may not actually be water but soap that created too much suds inside the Amana machine. Remove the connection cover plate at the bottom of the Amana dishwasher with a screwdriver. Run a full cycle and watch the hoses that connect to the pump and to the drain. Inspect for any leaking connections. If you see a leaking connection, tighten the clamp around the hose with a screwdriver.